We all have certain perceptions about products or services we use. Some of them have a certain ‘glow’ about them. Perhaps it’s because they are doing something different, something that touches our core and reminds us of something real. What does it mean for a Company to have soul? First let’s take a look at what it means for food to have soul. 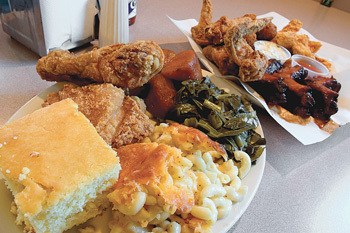 It’s hard to define soul food, buy my quick definition is food that makes you feel warm and comfortable. Having soul does not have to do with religion or with music. For a Company, having soul is about having a mission that is connected to the Common Good. Having a higher purpose. Meaning. Beliefs. Having a mission isn’t enough. Companies also need to execute on that mission and make it part of their DNA. Fender – Dedicated to quality guitars and it shows. In writing this I just noticed their amp section is advertised on the site as the “Soul of Tone”. Pete’s Wicked Ale – Pete’s was sold a few years back, but I saw the founder speak and it’s clear Pete’s had a mission of delivering a better quality micro-brew to consumers. This showed in their brand and was a key driver in their success. Ben & Jerrys – Another company that has been bought and sold, but their core belief in doing good for the greater good shows in their brand and products. Apple – Steve Jobs said that Apple’s core value is ““We believe that people with passion can change the world for the better”. Yes, there has been some anger lately in particular about Apple’s handling of iPhone apps and their relationship with Google. But there is something deeper at Apple that drives the company. As you can see no particular market segment has a monopoly on soul. A company with soul could be a giant multi-national or the bodega down the street. Having soul is one of the most critical things for a Company to have. If you provide meaningful context employees will be more driven, creative, and ultimately more productive. Tie your companies mission into the Common Good; the world-at-large. Having soul also rubs off on consumers. Consumers like soul. Like soul food, it makes them feel warm and comfortable. Consumers can sense it in a product or service. Having soul is about ingraining a companies mission into the daily values. Some companies might have the great potential for soul, but have not capitalized on it. Now scaling this soul over time is a whole different story…companies can also lose their soul and stray. Yahoo is the first company that comes to mind here. What other companies do you think have soul?